Rock out with this fun board game and you'll be learning all about math without even realizing it. Rockin' Math is a great educational game where players try to go from playing in their garage to the International Musical Awards. Combining both music and math, this children's board game is sure to capture an audience. Kids love to play games so why not make them fun and educational. 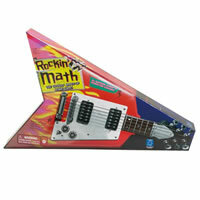 Rockin' Math does a great job and even has shaped their retail box in the shape of a guitar. From the illustrations to the simple game rules, this game is a winner. Give it a try and let us know what you think. If you can be the first player to reach the International Music Awards then you'll win. Inside is a game board, 4 game pieces, 200 question cards, a card holder and the official Rockin' Math game rules and instructions. Please keep in mind that the official Rockin' Math childrens rules and instructions could be different depending on the game version you have. The rules below are some of the exact directions on how to play Rockin' Math. Share with us your comments, funny stories, tips, advice, strategies, creative ways to play, questions about how to play, problems with the rules or anything you want about Rockin' Math. All submissions will be reviewed within 24 hours. Click here to add your Rockin' Math comments.